← Why do I blog about what I blog about? In July 1969, I watched, with my family, as the Eagle lunar module touched down on the moon and Neil Armstrong took humanity’s first steps out there. I remember some of the details of that day with great clarity, others not so well. A couple of things that must have been true on that day were: my dad came home from work and hung out on the couch while my mom made dinner; and the childhood dream of “being an astronaut” may have been considered possible for me, but not for my sisters. Today, in 2014, I watched, alone in my office, as the Philae lander disconnected from the Rosetta spacecraft and touched down on a comet 500,000,000 km away from here. In some ways we’ve made great progress in those 45 years; in some ways we haven’t. I want to talk about “the shirt”. But first, a preamble . . .
A ridiculous paper was published a few weeks ago that claimed that we’ve pretty much solved the sexism problem in academia. The paper was followed up by an Op-Ed piece in the New York Times that made the same argument even more clearly. Well, no. No, we haven’t. Rebuttals and takedowns of all the faulty assumptions, interpretations and conclusions in that paper were swift, and many, and loud (two great examples by Emily Willingham and Jonathan Eisen are here) as they should have been. Science does have a sexism problem, and that problem is manifested in many ways, both subtle and overt. We see ample evidence of it on social media, in the literature, in line-ups of invited speakers at symposia and panels, or in any random subset of tweets from people like Richard Dawkins. I won’t bother linking up to any of the many examples here, you just need to spend any amount of time interacting with scientists on Twitter to see how widespread the problem is. Now back to the comet . . .
Now, ok, I understand that many of us become scientists because we’re unconventional, because we’re individuals, because we’re quirky. Sure, some of us dress funny. I know lots of scientists, great scientists, who are pretty fond of Hawaiian shirts. 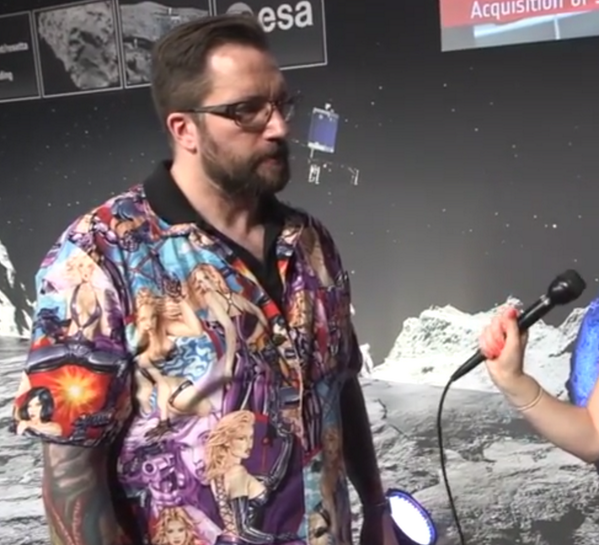 But, really, seriously, did it not occur to Matt Taylor for maybe just a nanosecond, that appearing on camera, as a scientist, at a defining moment in the history of space exploration, in a shirt festooned with sprawling half-naked women (and a couple o’ guns) might, I dunno, send the wrong goddamn message?!?! 2. We are not going to get there if some of our visible scientists use their brief moments in the spotlight to convey a message (unintentional or not!) that females are better suited to being decorations than to being colleagues. Science took a huge step forward today, and, thanks to one dumb fashion choice, one step back. This entry was posted in Science Culture and tagged science culture. Bookmark the permalink. I was very pleased to see Taylor’s apology. One small step. You put this so well. I wish more of the older men who hold high positions in academia shared your way of thinking. The blog and website of the Wheeler lab and the Lyman Museum at McGill University. Posts about arthropods, natural history, taxonomy, ecology, science culture, and life (or something like it) in academia. All content copyright Terry A. Wheeler 2011-2016, unless otherwise noted.